This is 1-string Hematite and Gold Mother Bracelet with 2 kids' names: KEENE and KEIFER. They added a Heart within a Heart charm and picked one of my beautiful free Twisted Toggle clasps. 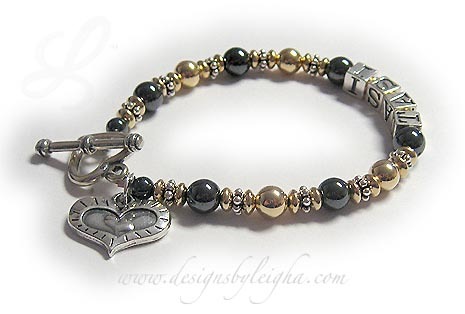 This Gold, Hematite and Sterling Mothers Bracelet is designed with 6mm smooth round Hematite beads, 14k gold-filled and .925 sterling silver beads and a sterling silver toggle clasp (you choose the clasp during checkout). The price is per string. Also available in all sterling silver and hematite. This is 1-string Hematite and Gold Mother Bracelet with 2 kids' names: KEENE and KEIFER. They added a Heart within a Heart charm and picked one of my beautiful free Twisted Toggle clasps. 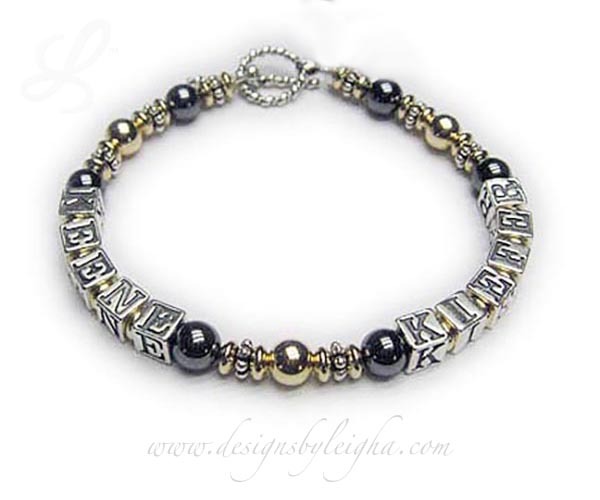 This 1-string Hematite and Gold Mother Bracelet with 1 name. They added a Heart within a Heart charm and upgraded the clasp to a Heavy Heart Toggle.